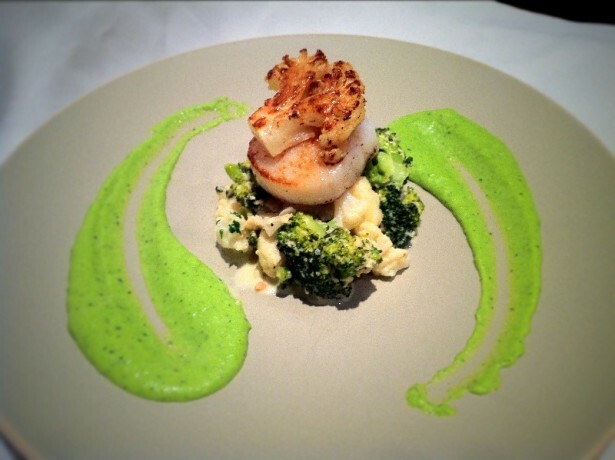 Scallops with Broccoli and Cauliflower risotto. It has been a while since I have posted any starters. It doesn’t give you a particularly balanced dinner party without one. I wanted to create a scallop main course, I still can’t think of one apart from some pasta, chorizo and scallops. Hence I made two scallop starters instead. I’ll post the other one soon. This is a simple dish to create at home and will get you top marks for presentation and taste. Make the pea puree by heating the peas with the cream for 2 minutes. Add the mint and blitz with a stick blender, season with salt and black pepper. Pass through a sieve for extra smoothness. Steam the large broccoli florets for 7 minutes. Place in iced water until later. Start cooking the remaining florets and garlic in a good knob of butter. After 5 minutes heat a pan and cook the large floret for one minute on one side. Flip it over and add the scallops to the same pan. Season with table salt and ground black pepper. Flip the scallops after 30secs. After 7 minutes of cooking the florets, turn off the heat, add the mascarpone and chopped mint. Season to taste. Be as creative as you like with puree, place a round of risotto in the centre of the plates. Add a scallop and top with a large floret. A beautifully colourful dish David. We do an amazing scallop with Avocado paste, the combination is outstanding. I’m going to revisit it in the coming months because the photos I took are awful, plus I’ve adapted the recipe to include a little coconut milk powder. On an unrelated topic, have you made balsamic pearls before? I am trying to find Agar Agar without flavouring but it’s proving to be tougher than it should. Let me know if you have a source. If no joy, I can either send you some of my powder or go and buy you a pot of the pearls and send them. Let me know how you get on. What a visually delightful starter and I’m sure it tasted really good. I’m eyeing that gorgeous crispy cauliflower floret on top! Love cauliflower and broccoli and always looking for different ways to include them on my table. The scallop is gorgeous too, but I’m a bit wary of shellfish, I’m allergic to something but I don’t know what! The arrangement on the plate looks very impressive. I adore scallops, I should cook them more, lovely idea. Thanks Danny, I suppose it doesn’t get ay better than beautiful to look at, delicious to eat and guilt free. Such a pretty dish, I love how you plated…so elegant. The combination of flavors sounds amazing. Hi Juliana, sorry for the late reply. Work has been demanding this week! I hope you have found some inspiration on the blog. A gorgeous appetizer and love that mint mascapone cream. I bet that golden cauliflower on top was delicious. Wishing you a super New Years and I have to catch up on your posts! Good to hear on all fronts.